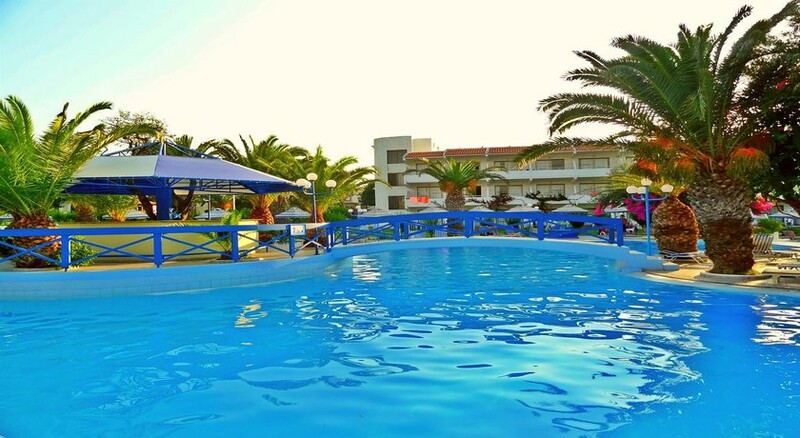 The complex can be found in the picturesque resort of Llayssos and it enables guests to get as much from their holiday as possible. The main beach is just a 10-minute stroll away where guests can get their adrenaline fix by trying some of the water sports on offer. The resort also offers a selection of traditional restaurants and bars and there is a lot of historical sites for guests to explore. From the palaeontology museum to the medieval city of Rhodes. So, whether guests want to soak up the sun or head off on an adventure, the location offers it all. Rhodes Airport is 5.5km away. The resort provides guests with a chance of accommodation including Double Rooms, Bungalows, Family Rooms and One Bedroom Apartments as well as self-catering Studios. All rooms are traditionally designed with a modern touch and all come with a host of facilities to ensure that guests have a comfortable stay. Accommodation comes with an en-suite bathroom, air-conditioning, TV, Fridge and Telephone while all have a balcony offering stunning views. 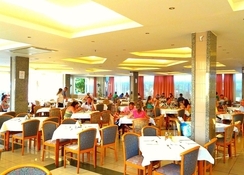 The all-inclusive buffet restaurant provides guests with an impressive selection of dishes and meals throughout the day. Guests can make the most of a wide selection of breakfast and lunch options as well as international dishes and local cuisine during dinner. The snack bar is ideal for those who enjoy a snack in between meals while there is a great choice of beverages available all day long while the main bar serves drinks long into the night. The large, impressive pools with waterfalls invite all guests to take a dip while the gardens and sun terraces provide the ideal place to lay back and enjoy the sunshine. 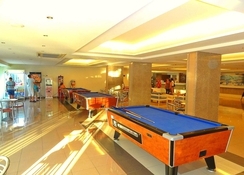 Kids can spend hours in the children’s pool while there are activities taking place all day long including volleyball, table tennis and basketball. The playground is the ideal place to take the children while the kid’s club gives adults the chance to relax or a few hours. The entertainment team puts on activities and entertainment throughout the day and during the evening. 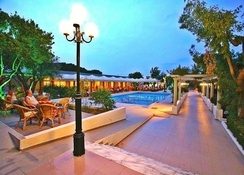 Amazing hotel with such lovely helpful and friendly staff couldn’t do enough for you! Lovely hotel will be back!